Well, today I did just about all the decorating I'm going to do. I hung the garland and ornaments from the branches of my dining room chandelier, as I always do. I set up my grandmother's ceramic Christmas tree, Christmas carolers, and part of her Nativity set. This year I didn't set up the stable, just some of the figures. Next to the figures I have a King James Version Bible open to Luke 2. I replaced my fall flowers with poinsettias and hung my wreath on the door. I also hung up the Christmas stocking that was made for me when I was a baby, and I have a small teddy bear peeking out of the stocking. I also hung a ring of small bells on my apartment door handle. Sounds just perfect, friend. I am focusing on getting all the stockings mended and hung up on the mantle. There are 11, ELEVEN, stockings! Quite a production! She doesn't mend the stockings, but she has a large number of them. 10 all together. I've done all mine as well. Windows are lit, the tree is up, and my collection of stuffed toys from Rudolph are out on the recliner. I impulsively bought a third string of solar Christmas lights when I was shopping yesterday afternoon. I blame the discussion here but only $15. However I would not think of putting them up until about a week before Christmas. Last year I did not put any up but I went to Sydney for Christmas. This year I am staying home. However with sunset now at 9.15pm I will have to stay up to see if they are working. I went to the Advent carol service in the Cathedral last night but it finished at 8pm so no lights on the way home. I will be going to the Christmas concert by the Dunedin Royal Male choir tonight and Tuesday of next week I will be going to "the Messiah" by the City Choir so will have a chance to check out any lights then. I got the Bumble in my collection. 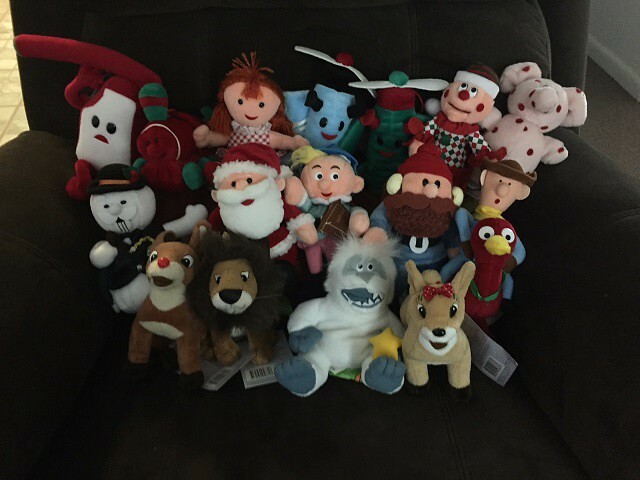 Front Row: Rudolph, King Moonracer (guardian of the Island of Misfit Toys), Abominable Snow Monster, and Clarice. Middle: Sam the Snowman, Santa, Hermy the elf, Yukon Cornelius and a misfit toy, the cowboy who rides an ostrich. Back: This misfit toys. Water pistol that shoots jelly, train with square wheels, Dolly, the planes that can't fly, Charlie in the Box, and the spotted elephant. However I would not think of putting them up until about a week before Christmas. Last year I did not put any up but I went to Sydney for Christmas. This year I am staying home. However with sunset now at 9.15pm I will have to stay up to see if they are working. I went to the Advent carol service in the Cathedral last night but it finished at 8pm so no lights on the way home. I will be going to the Christmas concert by the Dunedin Royal Male choir tonight and Tuesday of next week I will be going to "the Messiah" by the City Choir so will have a chance to check out any lights then. I've seen a few houses with the solar power lights, they are getting popular. Today, December 6, is St. Nicholas Day.